Ion Interferometers, the Bane of Chubby Photons? 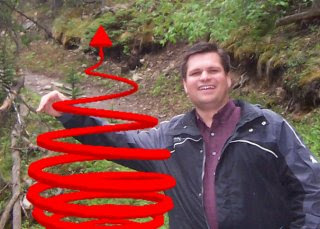 Dallin S. Durfee poses with an elusive "fat photon" during the 2007 meeting of the APS Division of Atomic, Molecular, and Optical Physics (DAMOP). Our current model of electromagnetism has held up to 2.5 centuries of scrutiny. But like nearly every other theory that science has embraced, it will probably eventually be shown to be incomplete. In a recent article in Physical Review Letters, researchers at Brigham Young University examined the potential of using ion interferometry to search for Coulomb’s-law violating electric fields inside of a conducting cavity. If Coulomb’s law is correct, the absolute voltage of the cavity should not affect the fields inside the cavity. But if it is violated, changing the voltage should alter the fields in the cavity. The proposed experiment was recently funded by a NIST Precision Measurement Grant and is currently under construction. In this experiment laser beams will be used to split the quantum wave functions of Strontium ions in two. The two waves will then recoil away from each other before being deflected back together and recombined by two additional laser beams. The last laser beam will cause the two waves to interfere, such that the final state of an ion will depend on the relative quantum phase of the two halves of its wave function. The presence of electric fields inside the conducting shell would cause the two waves to travel through different potentials and acquire different quantum phase shifts. This would change the overall phase of the interference in a predictable way, making it possible to determine the magnitude of the electric field from the final state of the ions. By monitoring the state of ions exiting the apparatus as a changing voltage is applied to the conducting shell, a very sensitive test of Coulomb’s law can be conducted. The theory of massive photons provides a useful way to compare experimental searches for Coulomb’s-law violations. This theory assumes that photons have a small, but non-zero rest mass, resulting in a limited range for Coulomb interactions. Although it is widely believed that the photon has zero rest mass, in today’s image conscious world it is just possible that photons aren’t telling us their true weight (after all, the neutrino maintained its massless image for decades). Based on calculations in their paper, the researchers predict that the experiment will be able to detect a rest mass of a few times 10-50 grams, about 100 times smaller than previous laboratory measurements. "Testing Nonclassical Theories of Electromagnetism with Ion Interferometry"
smart idea indeed! A well determined limit on photon mass would throw open a number of doors out of the well-established standard model of particles.